Make the pasta dough: On a clean work surface, mix together the semolina flour and the salt. Make a well in the flour and add the water to the center of the well a little at time. With a fork, gradually pull some of the flour into the water mixture, and continue mixing until a soft dough begins to form. With your hands, knead the dough until it is smooth and elastic, about 8 minutes. Cover the dough with a kitchen towel and let rest for 20 minutes. Cut the dough into desired shapes. Divide the dough into eight pieces and roll out each piece into a 1/4-inch-thick rope. With a pastry cutter or knife, cut the dough into 1-inch pieces. With your three center fingers, press down on a piece of dough and then drag the dough across the work surface toward your body to make an indentation. Transfer to a rimmed baking sheet lightly dusted with flour, and continue with the remaining pieces of dough. Set aside until needed. Heat 2 tablespoons of the oil in a straight-sided 11-inch skillet over medium heat. Add the garlic and cook until fragrant and lightly golden, about 2 minutes. Add the tomatoes and cook, stirring occasionally, until they begin to break down, 12 to 15 minutes. Toss in the parsley and season with a generous pinch of salt and a few grindings of pepper. In a 10-inch skillet, heat the remaining 1/4 cup of oil over medium heat. Add the dried peppers and cook until fragrant and crisp, 1 to 2 minutes. Transfer to a paper-towel-lined plate. 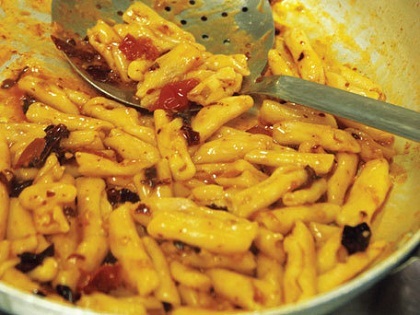 Toss the pasta with the tomato sauce, adding the reserved pasta water as needed if the sauce seems dry. Season to taste with salt and pepper. Crumble the peppers over the pasta and then top with the shaved ricotta. Serve immediately.